Heat the oven to 400°F. Beat 1 egg and water in a small bowl with a fork or whisk. Stir the remaining eggs, cheese, spinach, onion and parsley in a medium bowl. Unfold 1 pastry sheet on a lightly floured surface. Roll the pastry sheet into a 12-inch square. Cut into 16 (3-inch) squares. Repeat with the remaining pastry sheet, making 32 in all. 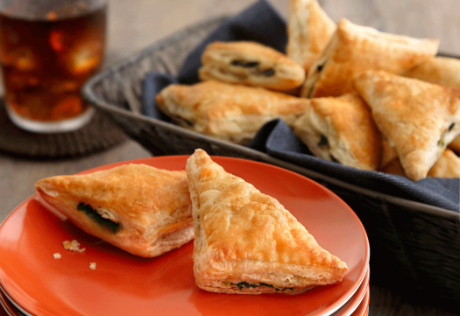 Place 1 tablespoon spinach mixture in the center of each square. Brush the edges of the pastry with the egg mixture. Fold the pastry over the filling to form triangles. Crimp the edges with a fork to seal. Place the filled pastries onto baking sheets. Brush with the egg mixture. Bake for 20 minutes or until the pastries are golden brown. Let the pastries cool on the baking sheets on wire racks for 10 minutes.